Operation Walk USA hasn't added a story. Operation Walk USA is a non-profit medical humanitarian organization that provides free hip or knee replacement surgeries for these patients. Operation Walk USA targets patients – US citizens and permanent residents – who do not qualify for government assistance programs. Harnessing a national network of volunteer hospitals, physicians, nurses, physical therapists and others, Operation Walk USA is committed to helping those in need by restoring their mobility, self dignity, productivity, and helping them return to their social world. Operation Walk USA hasn't posted any updates yet. 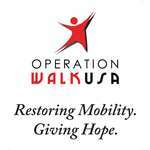 Operation Walk USA is managing the funds for this campaign.